Installation requires fewer than twenty commands. There's no database to worry about because PmWiki writes your pages into "page files" in the pagestore directory (wiki.d/). You'll download four archive files, totaling about 1/2 megabyte in size. The installation log is for a webserver running Linux/BSD/macOS. Log in via SSH or use a terminal app to type in the commands. You can also install the software via SFTP or FTP. 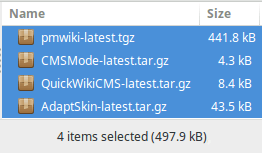 The current PmWiki version is shown on the download page. ## wiki.d/ (the pagestore directory) and uploads/ on the first visit.